ORLANDO, FL--(Marketwired - October 15, 2013) - Southwest Airlines Vacations is offering up to three free nights at select Walt Disney World® Resort Hotels when booking a Southwest Vacations package. 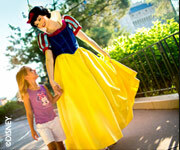 Southwest Vacations can enhance travelers' vacation experiences with a luxurious trip to Walt Disney World® Resort. Guests can add theme park tickets to their vacation package to spend their days exploring the theme parks, and their evenings enjoying the comfort of Deluxe Hotel accommodations. Travelers can satisfy their appetite with award winning cuisine at any one of Walt Disney World® Resort's fine dining experiences. Tee it up at one of Disney's championship golf courses, or get pampered with an invigorating treatment at Disney's new full service spa, Senses. The luxuries of a magical Walt Disney World® Resort vacation package are awaiting guests' arrival. To take advantage of this Walt Disney World® Resort vacation deal, travelers must book their packages between October 8, 2013 and October 28, 2013 by 6:00 p.m. Central Time for travel January 5, 2014 through April 6, 2014. One-day advance purchase is required. Restrictions may apply. Customized vacation packages include roundtrip flight via Southwest Airlines® and hotel accommodations (including taxes). Plus, first and second checked Bags Fly Free® -- savings of up to $120 per person, roundtrip.† Even Golf Bags Fly Free®. Visit the Benefits of Booking a Southwest Vacation page to learn more about everything included in a customized vacation package. Two nights free offer is valid on a stay of six nights or more at Disney's All-Star Music Resort, Disney's All-Star Sports Resort, Disney's Caribbean Beach Resort, Disney's Coronado Springs Resort, Disney's Pop Century Resort, and Disney's Port Orleans Resort -- Riverside. Three nights free offer is valid on a stay of seven nights or more at Disney's Animal Kingdom Resort, Disney's Contemporary Resort, Disney's Old Key West Resort, Disney's Polynesian Resort, Disney's Saratoga Springs Resort & Spa, Disney's Wilderness Lodge, and Disney's Yacht Club Resort.